Jenson Button and Rubens Barrichello swept the board at the Australian Grand Prix in Brawn GP’s first outing – and Lewis Hamilton was handed a post-race third place after being on the right side of a stewards decision for a change. Button won from pole position, opening up clear space over Sebastian Vettel and Robert Kubica from the start but not securing the win until the pair crashed out with a handful of laps to go. By contrast Barrichello had a torrid race, dropping down the field at the start when his anti-stall kicked in and causing a crash that damaged his front wing, eliminated Heikki Kovalainen and ruined Mark Webber’s chances in front of his home fans. He had worked his way back up to fourth by the time Vettel and Kubica took each other out, handing him second place and delivering a remarkable finish to the former Honda team’s debut weekend as the Virgin-sponsored Brawn GP. Behind the Brawn cars, more chaos was caused as the field dodged wreckage from Kubica’s BMW and tried to work out how to pass Vettel as he attempted to bring his Red Bull home on three-and-a-half wheels – a reckless gesture that since cost him a large fine and a grid penalty for Malaysia. With the safety car out, Jarno Trulli ran wide from third place and Lewis Hamilton was unable to avoid passing as the Toyota driver recovered. Trulli – who started the race from the pitlane after his qualification time was wiped by the stewards – took back his place, crossed the line third, and celebrated on the podium. But stewards later ruled he should not have re-passed Hamilton and penalised him 25 seconds, dropping him from the points positions and elevating the McLaren driver – who started 18th – to third. 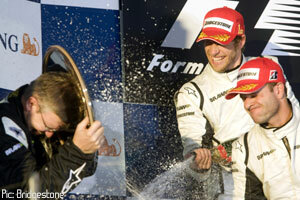 Hamilton said: “We scored way more points than we could have realistically expected. I was looking to try and get one point, so to get six is a great achievement. We’ve definitely not forgotten how to win: our strategy was perfect and the team did a fantastic job. Hamilton could yet be handed the win at Button’s expense, however, as the Brawn cars are among those affected by the controversy over potentially-illegal diffusers which will be settled at a hearing after the Malaysian Grand Prix. In total, five of the eight points finishers before Trulli’s demotion were from the teams whose cars face being banned – Button and Barrichello for Brawn, Trulli and his team-mate Timo Glock, and Williams’ Nico Rosberg. Only Kazauki Nakajima’s race-ending crash prevented all the affected drivers ending up in the points. Of the cars that failed to score, BWM and Robert Kubica had the most to complain about. Racing the final stint of the race on the more-advantageous medium tyres while Vettel and Button endured the less effective supersofts, he had a realistic chance of taking the victory until the crash that ended his race. The Ferraris of Felipe Massa and Kimi Raikkonen threatened for much of the race, but neither took the flag. Massa expired with a mechanical problem, while Raikkonen span into a wall, limped on ineffectively, and eventually retired. Takes into account Trulli’s penalty. Drivers whose result might be affected by the diffuser appear are marked with a star. Fantastic race, really thrilling right till the end. Safety car stayed out a bit long but all in all I thoroughly enjoyed the first race of the season and cant wait for Malaysia! Categorised under F1, tagged under Australian Grand Prix, Jenson Button, Lewis Hamilton, Martin Whitmarsh, Robert Kubica, Ross Brawn, Rubens Barrichello, Sebastian Vettel.